The core "cold unit" of the MicrostatHe2 Rectangular Tail, MicrostatHe2 and OptistatCF-V is inter-changeable, enabling a modular set of optical cryostats for different experimental set-ups by swapping only the outer body. 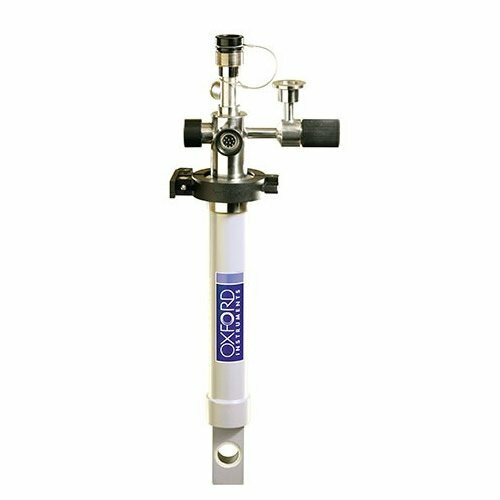 •Choose an LLT600 or LLT700 low loss LHe transfer tube for minimum helium consumption - less than 0.45 l/hr at 4.2 K! •NEW Transfer tube - It plays an important part in the overall helium consumption and base temperature capability of helium cooled cryostat. Oxford Instruments Low Loss Transfer tubes (LLT) use the cold gas exiting the cryostat to cool the shields surrounding the incoming liquid within the transfer tube. As a result, the consumption of our cryostats is the lowest on the market, dramatically reducing your running costs. We can also offer an extra flexible transfer tube for those with restricted space in their labs. Please note that as this does not use the gas cooled mechanism, helium consumption will be higher that for the LLT range. However it will be well suited to those who need lightweight and more flexible transfer tube. •NEW Gas flow controller- The new VC-U gas flow controller now includes the nitrogen and helium flow meters as standard. •NEW Intelligent cryogenic environment controller- Easy monitoring and control of the sample stage. The MercuryiTC controller combines several instruments into one allowing temperature control at the heat exchanger and gas flow control as well as an extra sensor channel for thermometry measurement directly at the sample stage. Everything can be accessed through touch screen front panel and remotely via Labview compatible Oxsoft IDK software. Example MicrostatHe2: You can control the temperature with a sensor and heater at the heat exchanger, monitor and control the gas flow AND have an extra sensor channel to measure sample temperature. •NEW Magnet power supply- Best in class stability performance and optimised for accuracy and low noise. •New Oxsoft IDK instrument development kit software - With the new Oxsoft IDK, you have new levels of control. You can design remote control and configuration programs and integrate your system into your preferred experiment control architecture.